This topic contains 215 replies, has 70 voices, and was last updated by Beth Napper 1 week, 2 days ago. So immediately after weaving for a few inches I noticed that I had too many warp threads in a dent over on the right (white). I’m using a 12 dent reed and threaded it 1-2-1-2… obviously I did 2-2-2 in that location. Also, I only had cottolin in the light grey and dark grey, and I believe it is a 22/2 that I grabbed… but I went with it, because I wanted to use up some stash. 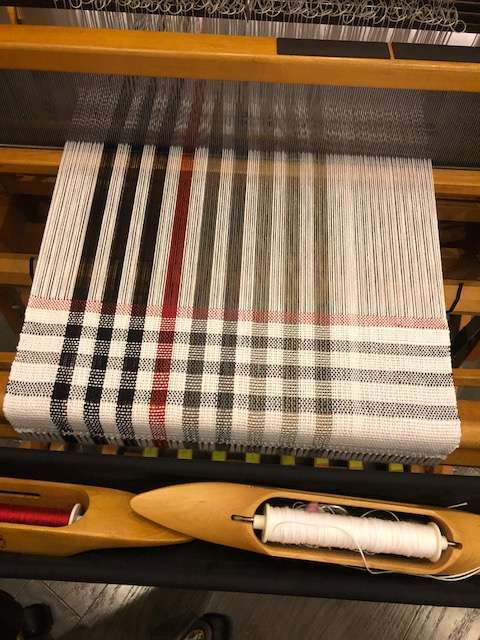 I did a strong beat on the fabric… only getting about 6 picks of cotton in, 7 for the cottolin in order to get shares. But this was a great project for me, a novice weaver, and I love the design. I will probably be trying this in other colors in the future. 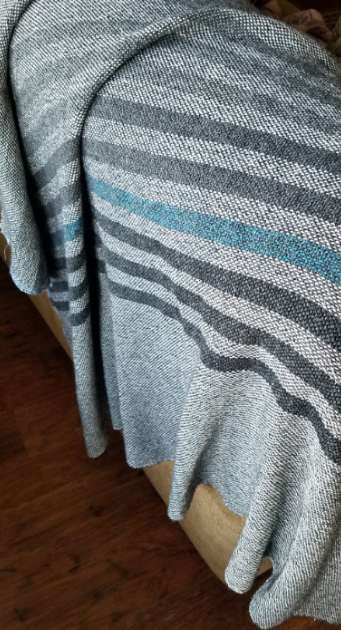 No, the wool was after I wove a bunch of towels with 8/2 cotton and then I changed out the red stripe for a turquoise one and re-sleyed to 12epi per Jane’s guidance. 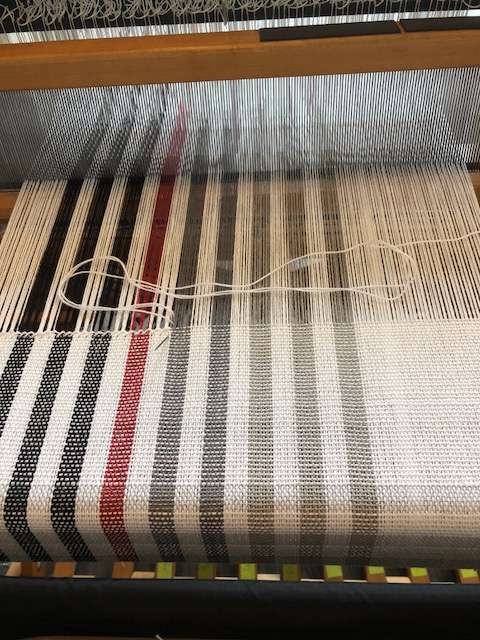 My warp was 400 threads, so it was 22.2″ in the reed at 18epi and then 33.3″ at 12epi. Did you leave the sett at 18epi when you used the wool for the weft? Beautiful results, lovely drape. It would be great as a poncho! It’s a wool I’ve had in my stash for about 15 years. It’s a worsted spun, so it fulled nicely and I’d say it’s about a sport weight in size. Jean, love your poncho, thanks for posting it, swapping the red for blue had been on my mind..now I know it works..and I love the wool with cotton idea! I was curious as to what kind, weight of wool you used? Thanks everyone! Pretty sure I’m going to make it a poncho. It’s so light and airy. Jean I love your throw. Beautiful. What a wonderful result from “playing”, Jean. It looks beautiful and cozy! Thanks for sharing. I’m SO EXCITED!!! 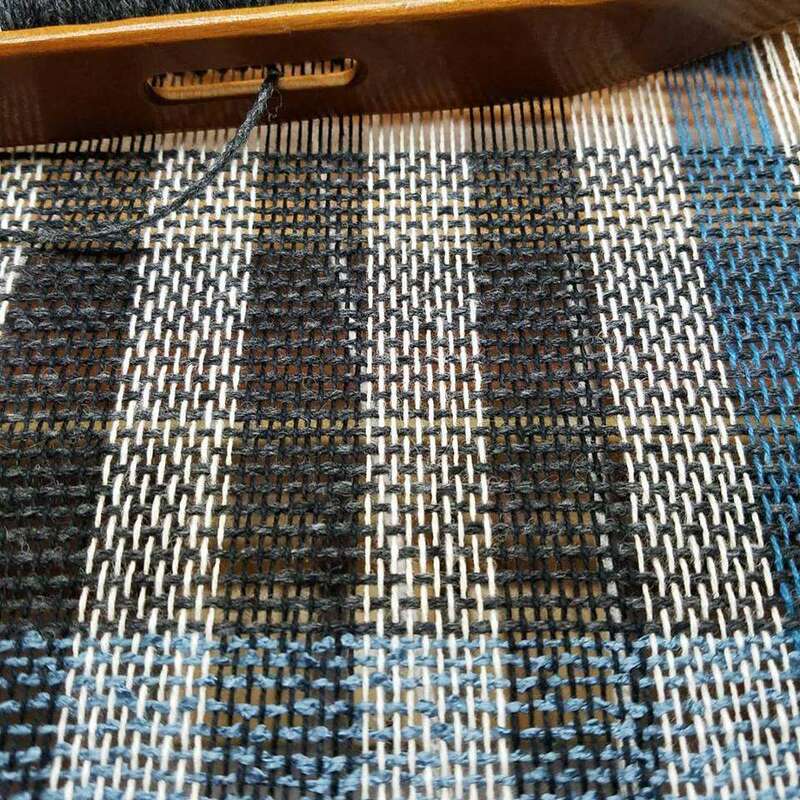 The wool worked BEAUTIFULLY with the cotton warp! I now have a small throw. I just wet finished it on delicate in the washer and then put it in the dryer for about ten minutes (checked it every few) and it’s beautiful. I tried to take the best pics so you could see the drape on this thing. I’m seriously considering turning it into a poncho. I love, love, love it!!! The mixture of cotton and wool will make it perfect for here in Central Texas. Thank you, Jane, for opening up this new concept to me. And, for the record, I’m sold on the 18epi for 8/2 cotton now! It is fun, right? Like we have permission to just play.